Adolescent Alabama belles have taken on the magical powers of ancient Greek heroes and mystics, with complicated results. 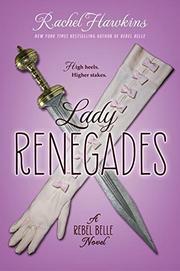 Now they try to resolve it all in this third installment of the Rebel Belle series. Protagonist Harper, now a powerful Paladin fighter, begins the book by getting into a battle with another Paladin. Harper wins but is puzzled—she’s supposed to be the only one. She and her friend Bee, with help from former enemy Blythe, a powerful Mage, realize that the only force able to create new Paladins is David, Harper’s boyfriend and the powerful Oracle whom it’s Harper’s duty to protect. However, the new Paladins she continues to encounter tell her that David believes she will kill him. David is on the run, so Harper reluctantly teams up with Blythe, and the two head out into neighboring states to find him. Harper, however, has another problem: her Paladin powers seem to be fading. And why does David think she’s trying to kill him? Hawkins drives her plot forward while throwing in enough rival-girl and friendly-girl chatter to keep chick-lit fans engaged. If the ending relies heavily on deus ex machina, fans won’t mind. It’s a satisfying conclusion to the mostly paranormal-with-a-bit-of-romance tale, all done with a definitive emphasis on well-to-do white Southern culture.